A shooting war between the US and Russia appears imminent. Following overnight speculation that the US may launch an airstrike on Syria at any moment, this morning, in his latest fiery tweetstorm, after slamming the failing New York Times and again lashing out at the Russia collusion probe and Cohen's office raid, Trump tweeted that "Russia vows to shoot down any and all missiles fired at Syria. Get ready Russia, because they will be coming, nice and new and “smart!” You shouldn’t be partners with a Gas Killing Animal who kills his people and enjoys it!" In any case, Trump's comment came in response to a statement by the Russian ambassador to Lebanon Alexander Zasypkin who said overnight that any U.S. missiles fired at Syria will be shot down and their launch sites targeted in response to Trump promise of a forceful response to an alleged chemical attack on a rebel enclave near Damascus. "If there is a strike by the Americans, then we refer to the statements of President [Vladimir] Putin and the chief of staff that the missiles will be downed and even the sources from which the missiles were fired," Zasypkin told Hezbollah's al-Manar TV. In response, Russian foreign ministry spokeswoman Maria Zakharova said that US "smart missiles should fly towards terrorists, not a legitimate government that has been fighting international terrorism for several years on its territory" and sarcastically noted that the US "smart missiles" could be an attempt to destroy evidence of the alleged "chemical attack" on the ground in Syria. RUSSIA RESPONDS TO Trump missiles-are-coming tweet. Earlier, Kremlin spokesman Dmitry Peskov told reporters that Russia “categorically” disagrees that a chemical attack took place in Syria. "I still want to hope that all parties will avoid any steps, which in reality aren’t provoked by anything, that can destabilize the already fragile situation in the region." Meanwhile, indicating that a US strike on Syria is imminent, on Tuesday Trump canceled a trip to Latin America to focus on the Syria incident, the White House said. Defense Secretary Jim Mattis also canceled plans to travel to California in the coming days, as Trump told reporters all options were on the table regarding Syria. As we reported on Monday, the USS Donald Cook, a Navy destroyer, left a port in Cyprus on Monday. The guided missile destroyer is armed with Tomahawk cruise missiles, which were used a year ago after an alleged sarin gas attack on Syrian civilians. Also overnight, Eurocontrol, the European air traffic control agency, warned airlines Tuesday to exercise caution in the eastern Mediterranean due to possible airstrikes in the next 72 hours. Retired Adm. James Stavridis, a former head of NATO and an NBC News analyst, warned that any U.S. strike on Syria would likely require manned aircraft and characterized it as a "high-risk operation." “Last year was about sending a signal,” Stavridis said, referring to the April 2017 strike ordered by Trump. “This year its about destroying actual Syrian capability." Of course, if Russia is serious and it intends to shoot down not only US missiles but their sources - including ships and fighter jets - what happens in the next several hours could unleash World War III. Which would be bizarre if the only purpose for that is for Trump to prove to Mueller that he is not, in fact, a Russian puppet, even as the Military Industrial Complex enjoys its final victory. 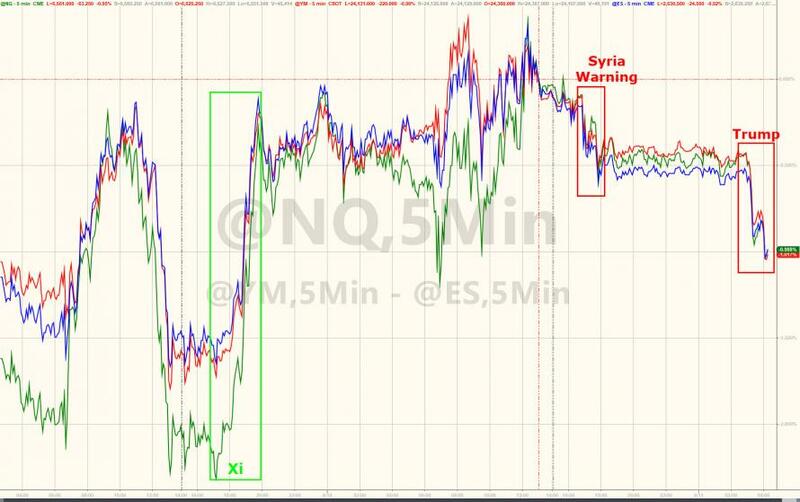 Perhaps somewhat surprisingly, futures did not like the news that war between the US and Russia may be coming, and slumped to session lows.